Mr Gunboat is an arcade style game designed to be played with one finger. 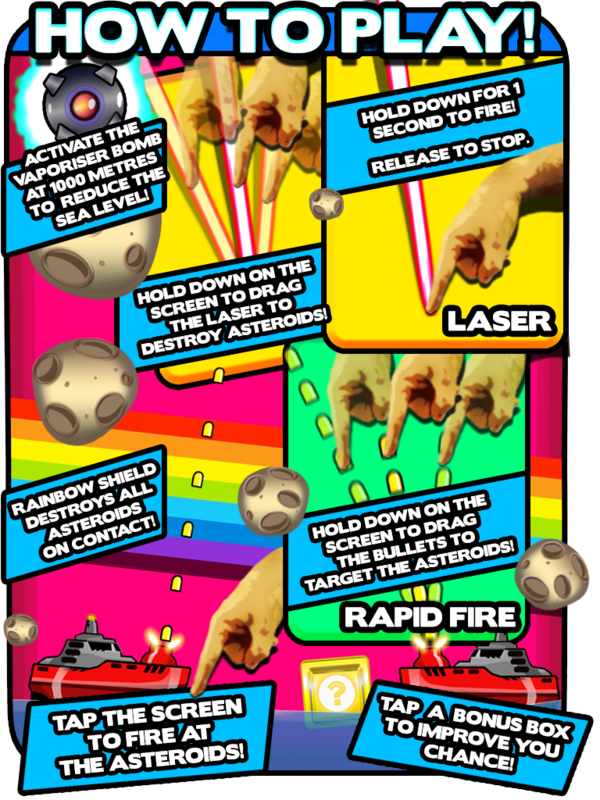 Just tap to shoot and destroy the asteroids. We don’t want the asteroids reaching the water and causing the water levels to rise. If the water levels raise too far the Earth will be flooded.. Simples. For extra fun we have bonus items that can be used just by tapping the yellow crates that fall from the sky. Extra Health 50% and Extra Health 100% are great for boosting health if Mr Gunboat has taken too many hits. Laser, triple shot and Submarine attack add extra fire power. Rainbow shield will destroy asteroids and protect Mr Gunboat. Rapid fire. No need to tap just hold finger down and shots will fire automatically. Remember folks these bonus items will run out. Look out for the count down warning. Our graphic artist has produced this rather nifty info-graphic to also help explain how to play the game.